Students at the College of William and Mary are taking action to advocate for a government response to climate change. Student environmental activist Hannah Ferster ’19 was arrested Dec. 10, 2018 with over 100 other Sunrise Movement protestors during a sit-in at the U.S. House of Representatives offices for the Green New Deal. The Sunrise Movement is a youth organizing group focused on advocating for the passage of Green New Deal legislation. The Green New Deal is a series of proposed policies to fight back against climate change with progressive economic and social legislation. Ferster began listening in on Sunrise Movement conference calls and later decided to join the organization at its lobbying day Dec. 10. 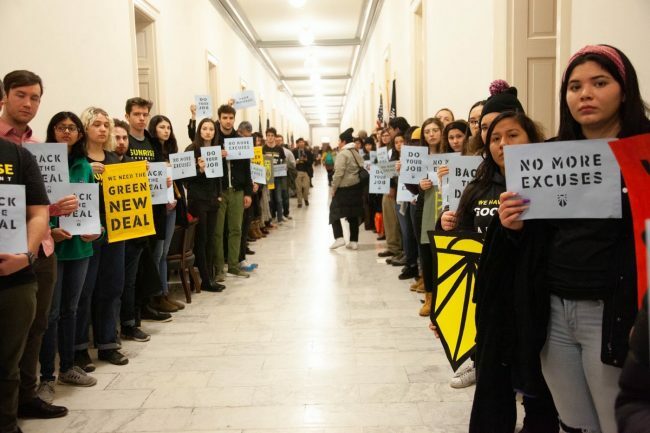 The lobbying day was focused on the creation of a Green New Deal select committee and included a planned sit-in in front of Democratic leaders’ offices, including House Speaker Nancy Pelosi, and Reps. Steny Hoyer and Jim McGovern. Before the lobbying day, activists like Ferster were given protest arrest training to be prepared for being detained by the Capitol police. Out of 1000 Sunrise Movement protestors, Ferster was among the 143 who were arrested for unlawful obstruction while sitting outside of Pelosi’s office. The protestors were handcuffed and led to a mass holding area where they were detained for six hours. They were let out after paying a cash bail. “I feel like that as a cisgender white person that’s a very relatively low risk experience for me and a good way to use that privilege in a way to fight for a cause that I really care about,” Ferster said. Ferster said that the urgency of climate change was what pushed her to risk being arrested with the Sunrise Movement. 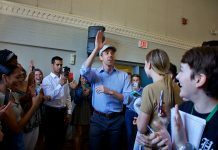 Ferster and other members of the College’s Student Environmental Activism Coalition are looking to bring Green New Deal advocacy onto campus. SEAC plans to recruit Sunrise Movement members as a branch of its sub-organization. Feb. 5, the Sunrise Movement will be hosting a Green New Deal launch party where students will be introduced to goals of the Sunrise Movement. The Sunrise Movement’s national group will also livestream into the event to discuss the strategies of their organization. 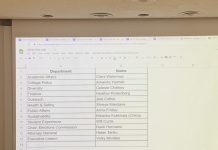 Sunrise Movement hopes to recruit the political base of the College’s students to help lobby for statewide Green New Deal resolutions led by Virginia delegates Sam Rasoul and Elizabeth Guzman. Both delegates have partnered with the Sunrise Movement and other groups like the Virginia NAACP hope to form a Green New Deal coalition. The Sunrise Movement’s Green New Deal launch party coincides with SEAC’s history of environmental activism and education on campus. Last semester, the organization arranged a climate change and migration panel with groups such as UndocuTribe, the Muslim Student Association, the Middle Eastern Student Association and College staff to initiate a discussion on the overlap between climate change and immigration that contained diverse perspectives. SEAC has also raised more than $1000 for anti-pipeline grassroots organizations in Virginia and has sent student protestors to the People’s Climate March and anti-pipeline protest camps. Sunrise Movement’s Green New Deal Launch party will be held in Blow Hall 333 from 7-9 p.m.